Rest day on the schedule today! 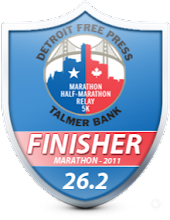 I changed my rest day to today since I'm racing the Corktown 5k on Sunday. I'll post the winners tomorrow for my two giveaways we well. Danielle Brenon, Desiree(Desi) Davila, Ariana Hilborn, Emma Kertesz, Dot McMahan, Lavenna Mullenback, Erin Richard, Neely Spence, Melissa Johnson-White, Jeremy Criscione, Bobby Curtis, Dustin Emerick, Brendan Gregg, Luke Humphrey, Brendan Martin, Mike Morgan, Drew Polley, Jake Riley, Robert Scribner, Ethan Shaw, Clint Verran, and last but not least Jeff from Detroit Runner. Oh, how'd I get in there? Ok, I guess I was probably dreaming about running at the speeds of these awesome runners on the Hansons-Brooks elite running team. I'm sure you recognize many, if not all of the names on that list. 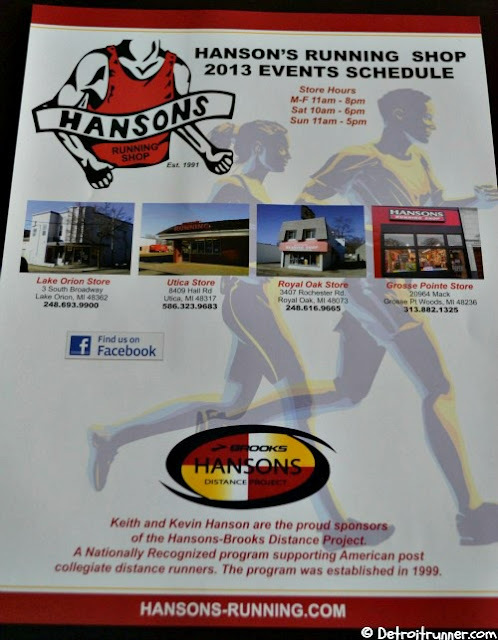 Here in the Detroit area, we are lucky enough to have THE Hanson's running stores and the elite Hanson's runners here training. 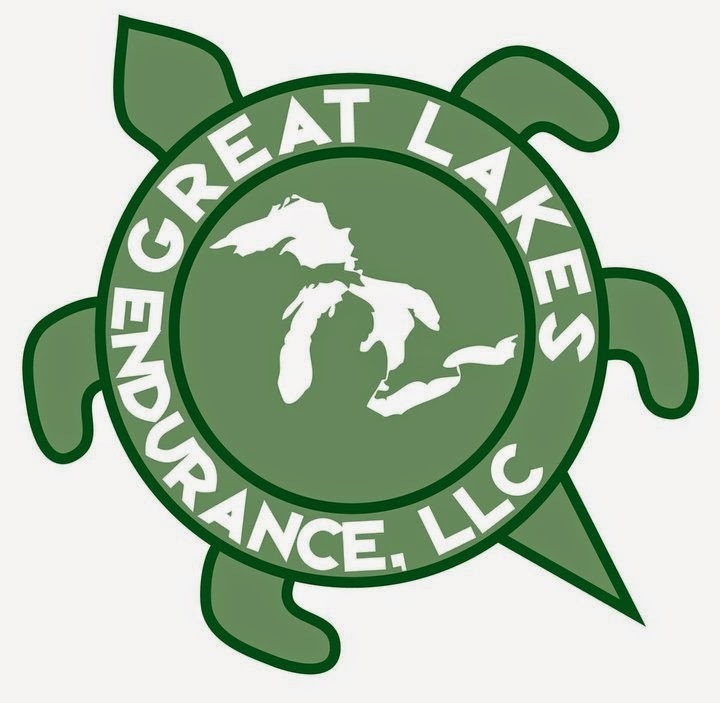 We see them often training at Stony Creek Metropark and Paint Creek trails. The store has four location throughout the metro Detroit including Lake Orion, Royal Oak, Grosse Pointe and Utica. 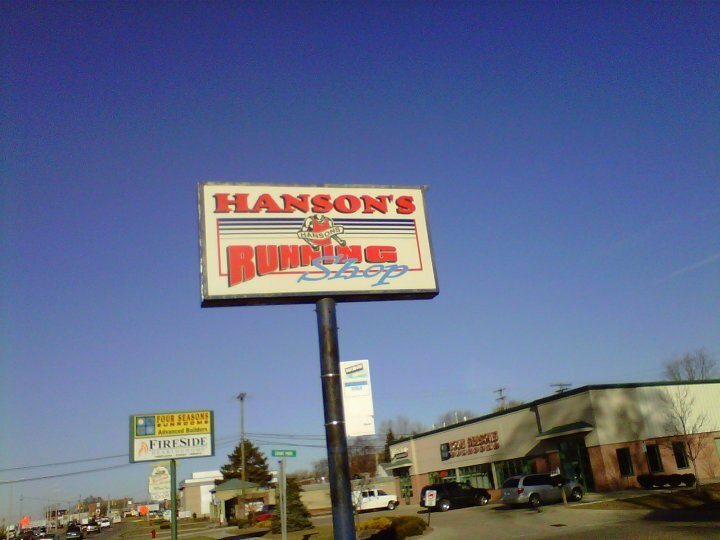 I happen to live near the Utica location and Hanson's recently announced they were starting a group run at that location. Count me in for the historic first group run of the Utica store. 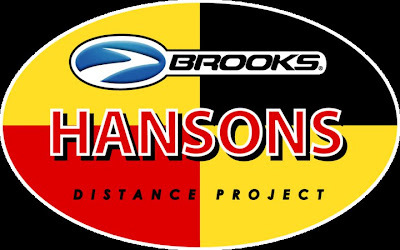 Ok, I have to admit, nobody from the Hansons-Brooks team was there, and frankly, I was not expecting them to be. 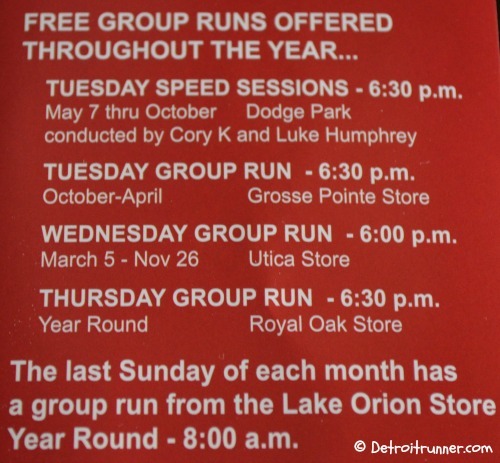 The group run is all about getting local runners together - new and experienced. 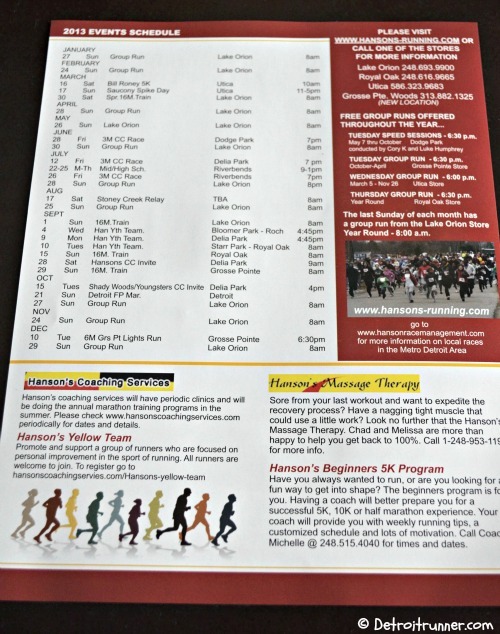 It's a chance to not only run with a group but also to run a new route and get to know a few more runners in the area. If you are new to running, it's a great way to learn some things from experience runners. I urge new runners to go and not be intimidated. 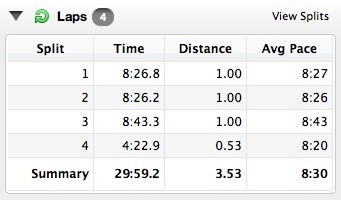 Surprisingly, I've never run with a group run in the three years I've been running. I've had running buddies for the weekend but not a regular group run. For this run, we will meet every Wednesday evening at 6pm. There will be random prizes given out and we also received a 10% discount on anything in the store. Here's a look at the Utica location. For me, it fits in pretty well since I can go directly from work to the run and then head home after. We had several options in regards to distance. We could run anywhere from 2.25-6 miles with the group and if you wanted to do more, the route basically made it easy to go up to about 13 miles. 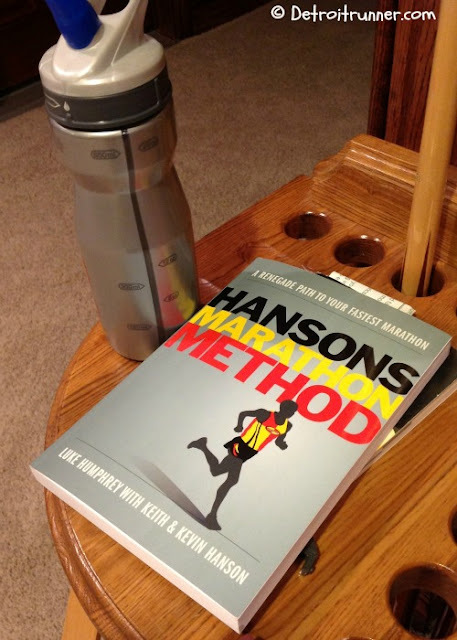 I can't say I'll ever want to run a 13 mile mid week run - I hated the 10 mile mid-week runs from my last marathon training schedule - but it's nice to know it's an option later in the season. It started to get a little dark on the way back from our run but since Sunday is daylight savings, there's no chance it will be dark when we finish anymore. 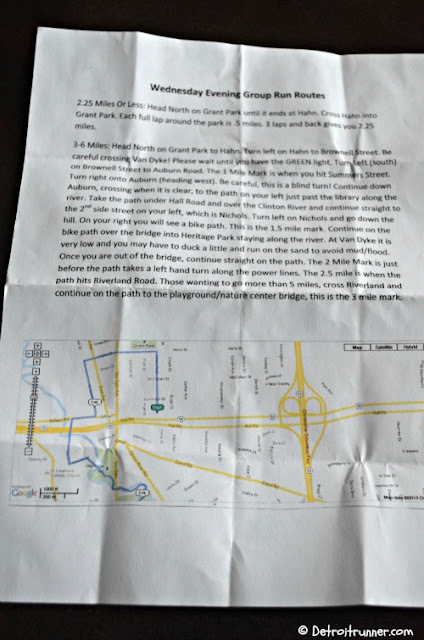 So they gave us some direction and gave us the map(see above) in case we got lost along the way. One of the employees ran with us as well heading out with the front of the pack. I backed off a little a lot from them and there were other runners behind me. I would say we probably had paces anywhere from 7 minute to 10 minute per mile. There was about 20 runners that showed up for the first run. I thought it was a good turnout. 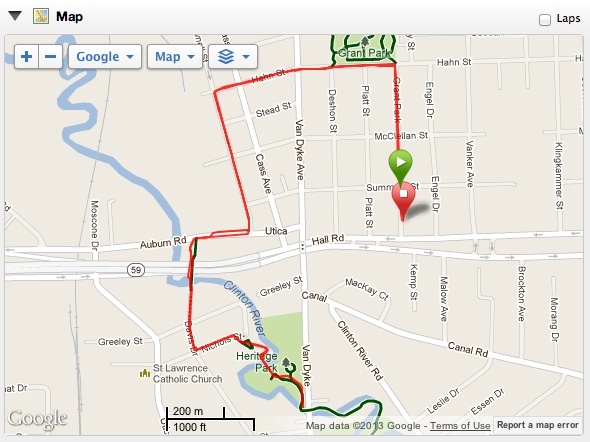 For todays' run, I decided to run about 4 miles. I had three on the schedule but I wanted to see where the route went. Basically it was an out and back route. We ran some of the neighborhood back behind the Hanson's store and then made our way through Downtown Utica. From there we went under M-59 through a tunnel and over the Clinton River and through more of the neighborhood and into Heritage Park until we made our way to Van Dyke. Perhaps I'll bring the camera some time to get some pictures of the route. Some of the group kept going on the trail but because the trail had been flooded from the thaw and snow and was muddy, I decided not to run in the mud after Van Dyke and made the turn around. Others also did the same. One of the best things about this run? The weather! First time I ran without a beanie this year - just a regular hat and a thin jacket. The biggest thing I worry about is running too fast a pace just to keep up but I was in my comfort zone and ran with one of the runners I met for much of the run since he was close to my pace. 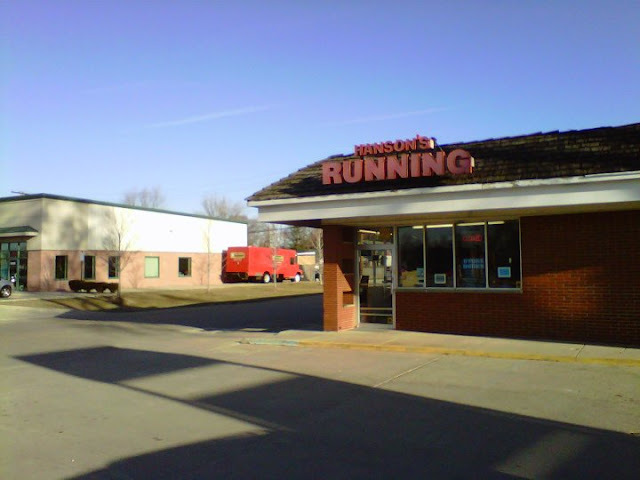 The store provided some water when we came back, so if you need water on your run, you needed to bring it with you(which I always do anyway). After the run, we chatted with some of the runners. I even got a chance to finally meet Lisa from Run Fast Mama. Go check out here blog, HERE. We forgot to get a picture of us. We were bad bloggers. LOL. I left about 7pm so we got our run in, got to talk a little after and got on our way in about an hour. I thought it was a nice change of pace to run with a group instead of always running in the dark before work so I'm definitely going to do it again. With that, I got a quick shot of their sign for you to see and left for home. 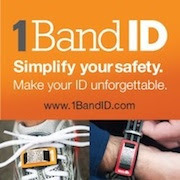 Do you run with a group ever or with your local running shop? What's your experience? 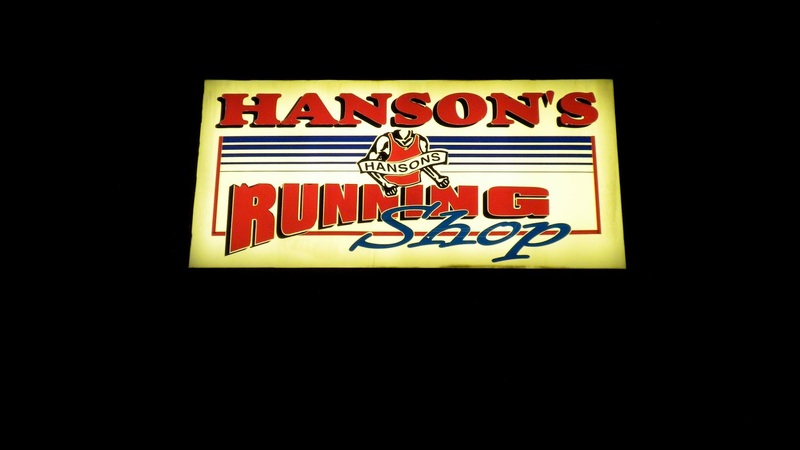 I've only managed to do one Hanson's group run. It was a weekend 16 mile training run. They do a few during the fall to get people ready for their marathon. It was very cool. They marked the route and provided a water stop midway. When I finished I was talking with the woman who was organizing the table of bananas and water. I soon realized it was Keith and Kevin Hanson's mother. I wish I could join the GP Store's run, but I have class. I really need to find a running group Downriver. This would be an awesome motivator to stay on track with my training. Great to meet you finally too! Yea, we started out together but considering 8:30 or there abouts is my goal 5K pace I headed towards the rear and ended up with a 9:30 pace. Not too bad and loved the route. I'm looking forward to next week, but based on the pace and route thinking these will be just me and leave the Hubby and kids at home. Visited my parents last night who haved lived in this area for 35 years now and my dad had no clue about the tunnels under the road! I didn't either, I have seen the big square opening next to the police station, but it never dawned on me. Great meeting you and see you again soon! I would love to be able to join one of the Hansons group runs. That is, if I lived remotely close to Hanson's shop!